There are many indicators that tell us whether someone is a good servant-leader in the workplace. 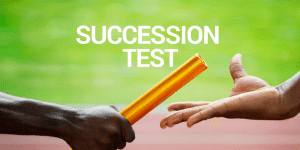 One of my favorites is the servant leadership succession test. Someone leaves a position – maybe a promotion, a lateral move, a departure – doesn’t matter. Or more specifically, how does that open position get filled? If the person leaving the position was a good servant-leader, then I bet a successor is (or successors are) ready, willing and able to fill the job. Servant-leaders in the workplace are strongly committed to both the professional and personal development of their team members. Development of people increases team performance, of course. But doing so is also considered a goal of servant-leadership, in and of itself. Servant-leaders want to create more servant-leaders, not more followers. And crappy supervisors in the workplace? Or, a crappy supervisor might designate a “successor” who is incompetent and therefore in no position to challenge the supervisor – or do the job should it become open. So, when the servant-leader moves on, the position is filled from within, by a well-prepared and trustworthy successor servant-leader. Seamless. Efficient and effective. High-performing. And when the crappy supervisor moves on? A job search. All the extra time, effort and money to fill the position. Maybe an outsider comes in and takes months learning the job and the workplace culture. Or worse, maybe an outsider comes in and doesn’t fit. Then the process starts again. That’s the servant leadership succession test. I’ve had the good fortune to have worked for servant-leaders who groomed me as their successors. I remain thankful for them. I hope you have that good fortune too! What do you think? Is the servant leadership succession test a good way to tell whether someone is a servant-leader in the workplace? Let us know. As always, we appreciate your views. And don’t forget to download our latest ebook, Servant Leadership in the Workplace: A Brief Introduction. It’s free! Filed Under: What is Servant Leadership? Love it and it’s true. I got more flack for being a servant leader, even told people think you are their slave.